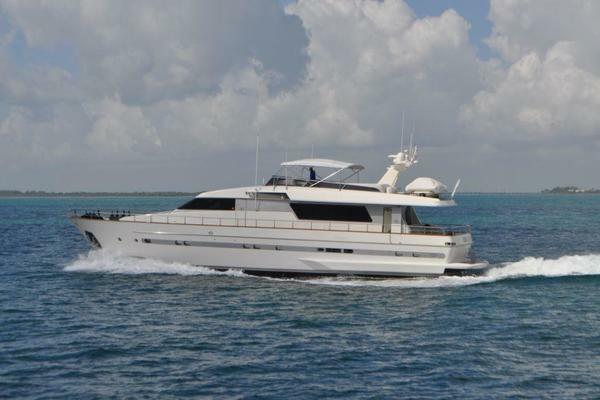 Fresh bottom paint, prop speed and new zincs in 2017.Graceful 70' Queenship Motor Yacht 4 PRINCESSES with impressive pilothouse and large flybridge combines head turning style with quality craftsmanship.This vessel is ready for cruising and features luxurious interior woodwork and flooring. Interior highlights include enclosed pilothouse with doors to port and starboard leading to wide walkways, elegant salon, home-sized galley, day head, washer, dryer, spacious master and VIP accommodations with separate crew quarters and large walk-in engine room. Expansive covered flybridge with ample seating can be accessed from galley and aft deck, forward Sunpads, aft cockpit with teak sole and u-shaped seating, curved teak staircases on port and starboard descend from aft deck to swim platform, watertight transom door for access to engine room and crew quarters. United Yacht Sales New Jersey would love to guide you through a personal showing of this 70' Queenship Baretta 2002. 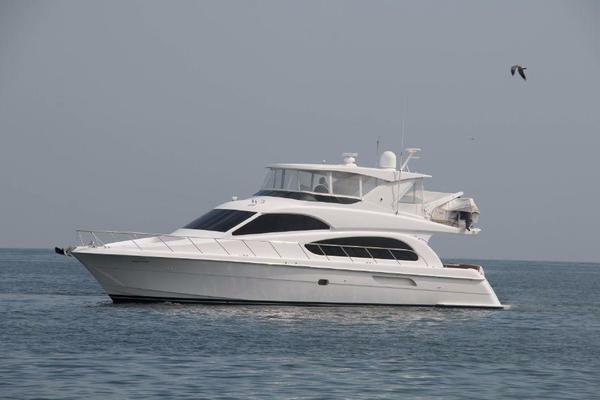 This yacht for sale is located in Fort Lauderdale, Florida and priced at $835,000. For a showing please contact us by filling out the form on this page and we will get back to you shortly! The engine room is accessed from either a staircase on the aft starboard side of salon or the access door from the swim platform. The stand up engine room is very large with easy access to all of the ship's mechanical and electrical systems as well as the gen sets. There are engine gauges, start up panels and fuel sight gauges on forward bulkhead, (2) crash pumps, Racor fuel filters, (7) Cruise Air compressors, Ravena oil changer system for mains and generator, Delta T system, and an air compressor. The pilothouse has sliding watertight doors on each side, and offers access from the tide ladder and access forward to the bow area. The lower helm has a beautiful high gloss cherry raised panel for great visibility and view of all the electronics. There are 2 black leather Stidd helm chairs with recessed foot rest and matching black leather console combing to reduce glare. There is a custom companion settee to starboard along with oak sole, chart storage and galley access. Entering the salon through a large slider from the aft deck one can appreciate the natural light offered from the vessel's large cabin windows. The high-gloss cherry interior and updated earth carpeting really work well. To port is a matching black leather sofa and reclining chair with end tables on each end of the sofa, and a single cocktail table in front of the sofa.A formal dining table is to starboard with 4 chairs, and custom cabinets are along the full length of the starboard side of salon with an integrated pop up surround sound system, a 42" pop up flat screen television, and wine cooler.Moving forward up 2 steps there is a curved stainless steel stairwell with teak treads heading to the flybridge. Just forward is the day head and across to the starboard side is the galley. The master is located amidships and offers the dimensions of a much larger motor yacht. There is a center-line king bed with matching built-in 2-drawer end tables along with halogen reading lamps above the pillow and wall lamps. To starboard side is full length cedar lined locker followed by a makeup vanity and aft are 6 drawers with above counter storage cabinets. To port is a matching full length cedar locker with a built in small settee and 6 drawers of storage. There is a new 42" Samsung LCD with cabinets below housing electronics. The en suite head has black Corian counter tops with 2 sinks and 2 cedar lines drawers. There is also a large Corian stall shower with Grohe shower head. The galley is to starboard as you head forward from the salon. It is a well-lit area with high gloss cherry finish and is complimented by black granite countertops. The refrigeration consists of low profile Sub Zero drawers with 4 designated for refrigeration and 2 drawers for freezers.There is a 4 burner propane gas cook top and icemaker below. Miele dishwasher and trash compactor. Overhead is a GE Convection Microwave and Keurig coffee maker. There are plenty of overhead cabinets on both sides, as well as deep storage below the sink to facilitate all storage needs. The VIP is located forward and is accessed from the port side companion way where you will find linen cabinets and separate washer/dryer units. There is a centerline queen bed with 4 large port holes that make for a very bright and open stateroom. Storage drawers are located below the bed and just forward is a full length cedar lined closet with 3 drawers and a wall mounted 19" Samsung LCD television. To starboard is the en suite head with matching high gloss cherry vanity with the black Corian top and single sink and storage below. A large stall shower with a glass door and mirrored ceilings and large porthole compliment the vanity. The aft deck has a teak sole with 2 custom built settees, a refrigerator, sink and access to the salon is through a large sliding door. On both sides of the aft deck are Euro style curved staircases to the teak swim platform, with access to the engine room and crew quarters. The flybridge is accessed from the outside by a molded stair case on the aft deck and from the inside by the custom curved Stainless steel staircase in the salon. Both have sliding glass doors. The helm area has 2 white Stidd helm chairs with floor rest. There is built-in L-shaped bench seating with new cushions that will comfortably seat 10. Aft is the deck chalks for the Nautica RB12 center console RIB with Yamaha 40 HP 4 stroke motor. A Nautical Structures low profile EX 1500 davit is located on the portside of bridge for tender launching.